Christmas trees will be collected curbside the week of January 14-18 on your regular trash day. Please cut large trees into 3-foot segments. Between December 26 and January 18, drop off your Christmas tree anytime at one of the below locations. Place trees inside the TTSD bins. 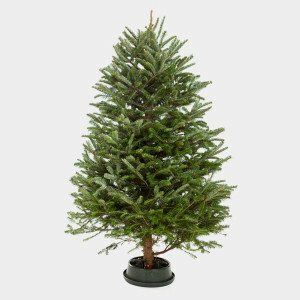 Clean, undecorated trees only, please! Before you recycle your live Christmas tree, make sure that it is free of all ornaments, lights and tinsel. If your tree has flocking (sprayed-on fake snow), it can’t be recycled and will have to go in the trash instead. It may be unconventional, but skipping the traditional Christmas tree (real or fake) altogether and decorating a potted tree you’ve bought or have in your home is a truly green way to have a tree for the holidays. Next holiday season, buy a tree with roots (it can be balled and burlap or containerized) and plant it in your yard after you use it. According to the National Christmas Tree Association (NCTA), the Christmas tree industry employs more than 100,000 people in the United States. Although they’re planted just to be cut down and used as a decoration once they’ve reached maturity, Christmas tree farms have a positive impact on the environment. Each acre of Christmas trees produces enough oxygen for the daily needs of 18 people.